Megan Kimmel wins in Russia! In her latest challenge she flew 10,000 miles in a trip that took her from her home town of Silverton across to Moscow and then down deep into southern Russia, a 72 hour journey to compete in one of the world’s most feared endurance races. A sprint and scramble up the 18,510 feet high Mount Elbrus, the highest peak in the Caucasus mountain range and depending on your view point, the highest point in all of Europe. And she won. Setting a new record for the fastest woman of 3 hrs 22 minutes. And to add an extra degree of difficulty she competed in the vertical kilometer the day before, a race from 2,500 meters to 3,500 meters. She won that too. 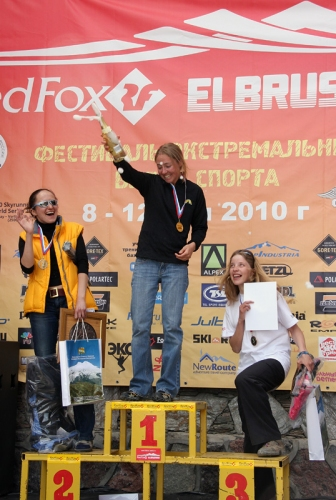 Megan was the only USA competitor in a field featuring athletes from Russia, Australia, Austria, Spain, New Zealand, Switzerland, Kirghizia, Kazakhstan, Latvia, and the Ukraine. This race is not for the faint hearted with athletes having a mandatory equipment list including such items as crampons, harness with two self-belayings, and sleeping bag.